From late 1872 to 1876, H.M.S. Challenger explored the world’s oceans. Conducting deep sea soundings, dredging the ocean floor, recording temperatures, observing weather, and collecting biological samples, the expedition laid the foundations for modern oceanography. Following the ship’s naturalists and their discoveries, earth scientist Doug Macdougall engagingly tells a story of Victorian-era adventure and ties these early explorations to the growth of modern scientific fields. 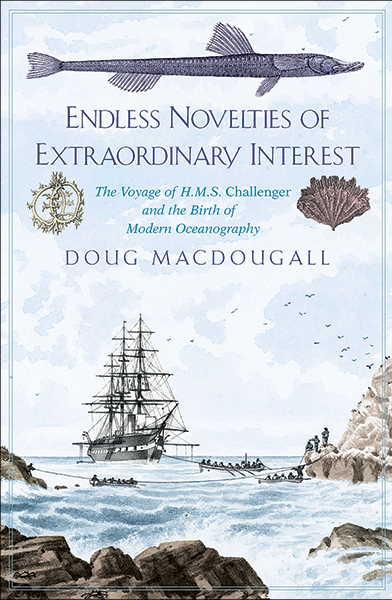 In this lively story of adventure, hardship, and humor, Macdougall examines the work of the expedition’s scientists, especially the naturalist Henry Moseley, who rigorously categorized the flora and fauna of the islands the ship visited, and the legacy of John Murray, considered the father of modern oceanography. Macdougall explores not just the expedition itself but also the iconic place that H.M.S. Challenger has achieved in the annals of ocean exploration and science. Doug Macdougall is emeritus professor of earth sciences at the Scripps Institution of Oceanography at the University of California, San Diego. He is the author of several books, including Why Geology Matters: Decoding the Past, Anticipating the Future.